OneMama’s initial goals are to provide traditional midwives with a clean and equipped birthing location. Our clinics also include electricity through generators or solar, if no electrical service is available. OneMama clinics also include refrigeration systems and electrical services for more sophisticated medical equipment, if available. BUILDING: OneMama builds 3-Wing clinics (Birthing wing, Medical Wing, and Economic Sustainability Wing) we estimate the cost to build an OneMama clinic averages $100,000- $150,000. • The follow up years cost $20,000 to $30,000 to maintain clinic running procedures. • The ideal model is to have a 3 wing clinic at each geographic location (birthing wing, medical wing, and educational economic sustainability community center) all based in improvised rural communities that use traditional midwives. 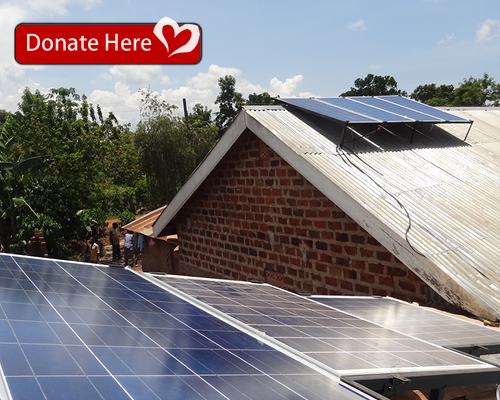 SOLAR: OneMama works with partners to supply and install solar panels and to provide power at our facilities. Bringing a light switch to these rural communities is a symbol of the bright future they have with OneMama on their side. WATER: Water is a whole family concern. In poor, rural communities throughout sub-Saharan Africa, millions of people lack access to safe, clean water. Women and girls mainly bear the burden of walking for miles to gather water from sources full of water-borne disease that make families sick. Illness from drinking dirty water and the time it takes to retrieve it sets back these communities we work so hard to help. The health and birthing clinics of OneMama depend and on healthy water, so OneMama is working hard to provide clean, safe well-water to the communities it services.